Cozy and comfortable 3-bedroom, 2 bath condo in the Leatherbark complex. This unit will sleep 8 comfortably with a pull-out full-sized sofa bed in the living area. You will love warming up by the electric fireplace and preparing your own meals in the beautiful, recently remodeled fully-equipped kitchen, which features stainless steel appliances. The spacious master bedroom features its own private full bath and comfy queen-sized bed. The second bedroom features a full-sized bed and is right next door to the 2nd full bath. This bedroom also has a large flat screen TV with an XBOX 360 and a few games for the kiddos in your group. The 3rd bedroom has 2 twin beds and is located next to the living area which has sliding accordion divider for privacy. This condo features dedicated Internet, Satellite TV, flat screen TVs, baseboard heat, and a stacked efficiency-sized washer and dryer. This property also features a private deck on the ground level which has a locked storage closet perfect for a couple of bikes. The Leatherbark complex is an easy 5 minute walk to the Village and the Ballhooter lift. This unit is on the first floor, however, from the parking lot, it will be necessary to take one flight of steps down once you are inside the building to reach our unit. Elevator access is not available in Leatherbark. Recently remodeled and decorated tastefully. Very clean and cozy. Comfortably sleeps 4 people. Modern kitchen with new oak cabinets. Refrigerator, dishwasher, and microwave. Full size stove and oven. Coffee maker. Cozy living room with a fold-out couch. Flat screen TV and Blu Ray player. Dining for four. High-Speed Internet from City Net. Coin operated laundry facilities are located down the hall by the elevators. Queen-sized bed in bedroom. Free Internet access. AWESOME VALUE! 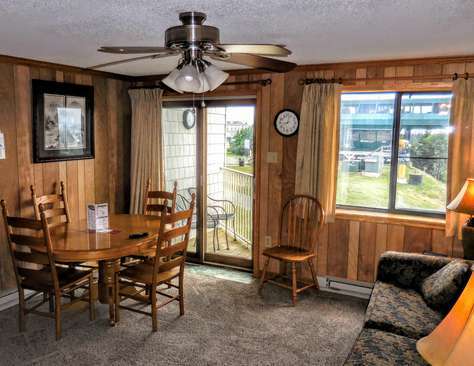 This unit is a triple threat with its awesome location, slope-side view and affordable rates! Mountain Lodge #230 is just a short walk to the Village shops and restaurants - and the Ballhooter high-speed chairlift is just outside the back of the building. 1 bedroom, 1 bath, ski-in/ski-out condo. Fully-equipped kitchen. Queen bed. Foldout couch. Wonderful view of the Ballhooter Chairlift and slopes from balcony and window. Once you arrive, park in the security guarded parking lot (free) and you won't have to drive again until you are ready to leave. Modern kitchen with new oak cabinets. Refrigerator, dishwasher, and microwave. Full size stove and oven. Coffee maker. Cozy living room with a fold-out couch. Flat screen TV & DVD player. Dining for four. Coin operated laundry facilities are located down the hall by the elevators. Only steps away from The Village and the Ballhooter lift. Once you arrive, park in the security-guarded lot and you won’t have to drive again until you are ready to leave. Restaurant, lounge, and Conference Center are all on-site. - Complimentary High-Speed Internet provided by City Net. Views of Shavers Lake and the mountains. Recently remodeled. Very clean & cozy!! You will totally feel at home in this lovely condo. Only steps away from The Village and the Ballhooter lift. Once you arrive, park in the security-guarded lot and you won’t have to drive again until you are ready to leave. Restaurant, lounge and Conference Center are all on-site. Expanded bathroom. Wall mount TV in bedroom (queen). Sleeps four comfortably. Modern kitchen with new oak cabinets. Refrigerator, dishwasher, and microwave. Full size stove and oven. Coffee maker. New dinette set. Cozy living room with a fold-out couch. High-quality Pella patio door. TV w/ DVD player. Dining for four. Coin operated laundry facilities are located down the hall by the elevators. Magnificent view of Shavers Lake and the mountains from balcony. You can see the Ballhooter lift from the balcony. Corner unit has extra window for viewing lake and mountains below! Only steps away from The Village. Once you arrive, park in the security-guarded lot and you won’t have to drive again until you are ready to leave. Restaurant, lounge and Conference Center are all on-site. TV and DVD player. Fully-equipped kitchen with refrigerator, dishwasher, and microwave. Full size stove and oven. Coffee maker. Cozy living room with a fold-out couch. Dining for four. Coin operated laundry facilities are located down the hall by the elevators. AWESOME VALUE! This unit is a triple threat with its awesome location, slope-side view and affordable rates! Mountain Lodge #244 is just a short walk to the Village shops and restaurants - and the Ballhooter high-speed chairlift is just outside the back of the building. 1 bedroom, 1 bath, ski-in/ski-out condo. Fully-equipped kitchen. Queen bed. Foldout couch. Wonderful view of the Ballhooter Chairlift and slopes from balcony and window. Once you arrive, park in the security guarded parking lot (free) and you won't have to drive again until you are ready to leave. All three bedrooms have queen-sized beds as well as a set of bunk beds in the third bedroom. Queen sized fold-out sofa in the living area. This unit can comfortably sleep up to ten (10) people. Each bedroom has a flat screen cable TV and two of the bedrooms have ensuite full bathrooms. Ceiling fans in each bedroom. The fully-equipped, eat-in kitchen includes stainless steel appliances; dishwasher, microwave, coffeepot, toaster, refrigerator, range and oven. The kitchen is well stocked with dinnerware, utensils, pots and pans, so you can enjoy preparing your own meals. Recessed ski rack in the hallway, plenty of room to hang up your gear! 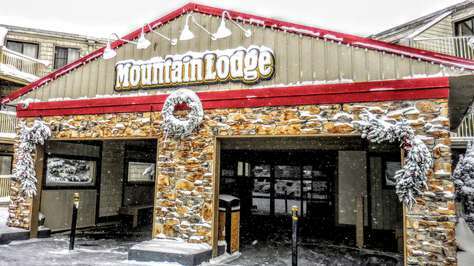 The back entrance of Mountain Lodge is 30 yards from the Ballhooter Lift and just a short walk to Snowshoe's Village restaurants and shops. - Complimentary in-room High-Seed Internet provided by City Net. - Complimentary in-room HD TV provided by DISH Network. - Coin operated laundry facilities are located down the hall. - Mountain Lodge features a large lobby with comfortable sofas and tables for games surrounding wood-burning fire place. Beautiful, GOLD RATED, 1 bedroom (QUEEN), 1 bath, ski-in/ski-out condo. Magnificent view of Shavers Lake and the mountains from balcony. Recently remodeled and decorated tastefully. Very clean and cozy. Comfortably sleeps 4 people. Free Internet access. Portable A/C in Summer. Modern kitchen with new oak cabinets. Refrigerator, dishwasher, and microwave. Full size stove and oven. Coffee maker. Cozy living room with a fold-out couch. Flat screen TV and Blu Ray player. Dining for four. High-Speed Internet from City Net. Air conditioning in Summer months. Coin operated laundry facilities are located down the hall by the elevators. Refrigerator, dishwasher, and microwave. Full size stove and oven. Coffee maker. Cozy living room with a new fold-out couch (2017). Flat screen TV's in living area and bedroom. Dining for four. Free Wi-Fi Internet access. Comfortably sleeps 4 people. New mattress and box springs (2017) will make for a good night's sleep! You will totally feel at home in this third-floor condo (less noise!!). Only steps away from The Village and the Ballhooter lift. Once you arrive, park in the security-guarded lot and you won’t have to drive again until you are ready to leave. Restaurant, lounge and Conference Center are all on-site. ABOUT THE AREA - Snowshoe Mountain, West Virginia is the premier ski resort in the Mid-Atlantic region with a whopping elevation of 4,848 feet. Typically, Snowshoe receives an average of 180 inches of natural snowfall each year. Snowshoe features 57 trails within 3 different ski areas: The Basin, The Western Territory and Silver Creek with 100% snowmaking capabilities in each area. The Western Territory boasts expert only terrain with a 1,500 foot vertical drop and the longest trail on the mountain, 1.5 miles. Silver Creek is popular for its night skiing, terrain park features and the Coca-Cola tubing park. A free shuttle service is provided to get you from one area to another. If you are not a skier or rider, there are still plenty of wintertime activities for the whole family. Snowshoe Mountain offers RZR and Snowmobile tours, as well as Snow-Cat tours where you can learn more about the art of grooming. Plus, there are a variety of shops and restaurants in the village and around the mountain. If you are looking for some relaxation and pampering, you may want to visit the Spa at Snowshoe. In the summertime, Snowshoe continues its vibrancy with festivals, such as Blues, Brews and BBQ, Fire on the Mountain Chili Cook-Off, The Grand National Cross Country (GNCC) off-road ATV and motorcycle racing series, Free-Fall Festival and other various wine and jazz events. If you are one for lots of activity, Snowshoe offers rugged Segway tours, hiking, downhill mountain biking (you can even put your bike on the lift and get a ride to the top), kayaking, canoeing, fishing at Shavers Lake and golf at the Raven Golf Course. Motorcyclists flock to the mountain to enjoy all of the curvy mountainous and scenic roads in the area. If you are looking to hop aboard a historic steam train, Cass Railroad is the place to go. The station is just 10 miles away. For a longer day trip, head to Seneca Rocks for some amazing rock climbing and cliff views. More details on Snowshoe’s winter and summer events and activities can be found on their website, it is definitely worth a visit! Property Overview - Renovated Mountain Lodge and on the slope-side. One of the nicest units you will find in Mountain Lodge. It is next door to and has a connecting door to #326 if your group needs extra special place. One bedroom, one bathroom, extra closet space, expanded bathroom, custom kitchen, bump out area in hall for ski rack, slope side, top floor and more. Property Overview - Renovated Mountain Lodge and on the slope-side. One of the nicest units you will find in Mountain Lodge. It is next door to and has a connecting door to #324 if your group needs extra special place. One bedroom, one bathroom, extra closet space, expanded bathroom, custom kitchen, bump out area in hall for ski rack, slope side, top floor and more. 1 bedroom, 1 bath, ski-in/ski-out condo. Wonderful view of the Ballhooter Chairlift and slopes from balcony and window. Steps away from The Village and the Ballhooter lift. Once you arrive, park in the security-guarded lot and you won't have to drive again until you are ready to leave. Restaurant (Winter only) and Conference Center are on-site. Portable A/C unit during Summer months. Price includes parking and cleaning. BEST VIEW ON THE MOUNTAIN! Fully-equipped kitchen. Refrigerator, dishwasher, and microwave. Full size stove and oven. Coffee maker. Cozy living room with a fold-out couch. Flat screen TV & DVD player. Dining for four. Ski rack in hallway to safely store your gear. Coin operated laundry facilities are located down the hall by the elevators. ABOUT THE AREA - Snowshoe Mountain, West Virginia is the premier ski resort in the Mid-Atlantic region with a whopping elevation of 4,848 feet. Typically, Snowshoe receives an average of 180 inches of natural snowfall each year. Snowshoe features 57 trails within 3 different ski areas: The Basin, The Western Territory and Silver Creek with 100% snowmaking capabilities in each area. The Western Territory boasts expert only terrain with a 1,500 foot vertical drop and the longest trail on the mountain, 1.5 miles. Silver Creek is popular for its night skiing, terrain park features and the Coca-Cola tubing park. A free shuttle service is provided to get you from one area to another. If you are not a skier or rider, there are still plenty of wintertime activities for the whole family. Snowshoe Mountain offers RZR and Snowmobile tours, as well as Snow-Cat tours where you can learn more about the art of grooming. Plus, there are a variety of shops and restaurants in the village and around the mountain. If you are looking for some relaxation and pampering, you may want to visit the Spa at Snowshoe. In the summertime, Snowshoe continues its vibrancy with festivals, such as Blues, Brews and BBQ, Fire on the Mountain Chili Cook-Off, The Grand National Cross Country (GNCC) off-road ATV and motorcycle racing series, FreeFall Festival and other various wine and jazz events. If you are one for lots of activity, Snowshoe offers rugged Segway tours, hiking, downhill mountain biking (you can even put your bike on the lift and get a ride to the top), kayaking, canoeing, fishing at Shavers Lake and golf at the Raven Golf Course. Motorcyclists flock to the mountain to enjoy all of the curvy mountainous and scenic roads in the area. If you are looking to hop aboard a historic steam train, Cass Railroad is the place to go. The station is just 10 miles away. For a longer day trip, head to Seneca Rocks for some amazing rock climbing and cliff views. Modern kitchen with new oak cabinets. Refrigerator, dishwasher, and microwave. Full size stove and oven. Coffee maker. Cozy living room with a fold-out couch. Flat screen TV & DVD player. Dining for four around kitchen island. Queen-sized bed in bedroom. Recessed ski rack in hallway. Coin operated laundry facilities are located down the hall by the elevators. Third floor unit means LESS noise! Beautiful view of the West Virginia mountains and Shavers Lake! Only steps away from The Village and the Ballhooter lift. Once you arrive, park in the security-guarded lot and you won’t have to drive again until you are ready to leave. Restaurant (winter only), lounge (winter only), and Conference Center are all on-site. - DISH Network TV with HD channels. Modern kitchen with new oak cabinets. Refrigerator, dishwasher, and microwave. Full size stove and oven. Coffee maker. Cozy living room with a fold-out couch. Flat screen TV & DVD player. Dining for four around kitchen island. Queen-sized bed (BeautyRest mattress) in bedroom. Recessed ski rack in hallway. Coin operated laundry facilities are located down the hall by the elevators. Third floor unit means LESS noise! Beautiful view of the West Virginia mountains and Shavers Lake! Only steps away from The Village and the Ballhooter lift. Once you arrive, park in the security-guarded lot and you won’t have to drive again until you are ready to leave. Restaurant (winter only), lounge (winter only), and Conference Center are all on-site.